Chocolate. Fudge. Zucchini. Brownies. | Eat More Plants. When I was younger, one of my absolute weaknesses was undercooked brownies. That sounds kind of strange…but you know, some people cook their brownies all the way through and they taste like chocolate cake. If I wanted chocolate cake, I’d make it. Brownies should be gooey and fudgey. So, I started searching for zucchini bread recipes and then realized wow, zucchini bread is boring. So, I started looking for zucchini brownies and was surprised by how many recipes there were! Unfortunately, the more I read them, the more I realized that a lot of them were loaded with sugar and had ingredients that wouldn’t be easy for everyone to find. I merged a bunch of different recipes together, lowered the amount of sugar and like any good baker, I replaced half the oil with applesauce. The results were damn good. 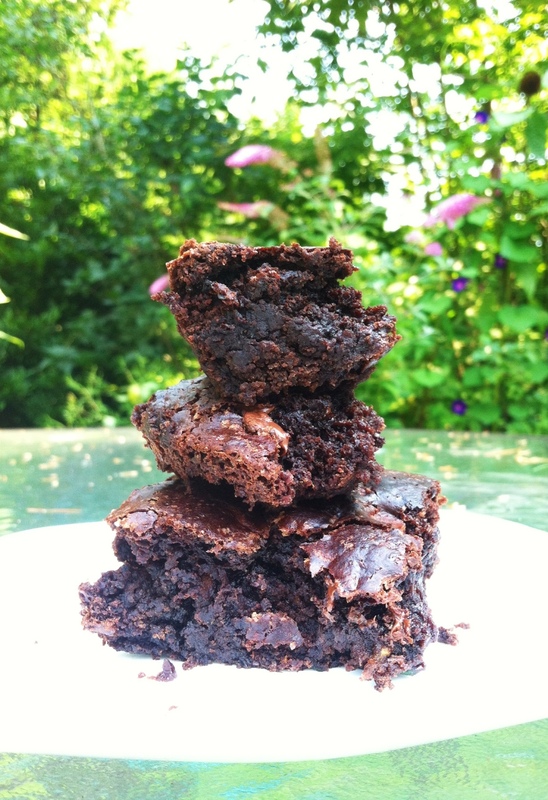 But be warned: if you don’t like gooey brownies, don’t bother making these. They are my childhood dream come true. Also a great way to use some of those extra zucchinis you have…! Mix oil, applesauce, vanilla and sugar until smooth. In a separate bowl sift together cocoa, flour, baking soda and salt. Add wet ingredients to the dry bowl and mix well. Add zucchini and chocolate chips and mix until completely incorporated. Batter will be thick! Grease an 8×11 or 9×9 baking dish. Pour batter in and smooth out with a spatula. Bake at 350 for 30 minutes. Check for doneness by sticking a toothpick in different areas. The toothpick should come out a bit sticky in most places besides the crust but not completely raw. Be careful not to burn the top! I baked my brownies for about 35 minutes in total. Let cool for 20 minutes before cutting. I’ve been tempted to try courgette brownies for a while, and this recipe jumped out above all others— and I am SOOOOOO GLAD I tried it!!!! Yum yum yum!! !